We study static spherically symmetric configurations in the presence of linear massive scalar fields within General Relativity. Static solutions of the Einstein equations are considered under conditions of asymptotic flatness. Each solution is fixed by the configuration mass and the field strength parameter, which are defined at spatial infinity. The metric coefficients and the scalar field for a specific configuration are obtained numerically. Then we study the time-like geodesics describing the test particle motion. The focus is on the distribution of stable circular orbits (SCOs) of the test particles around a configuration. We found that, for the continuum of configuration parameters, there exist two unlinked regions of SCOs that are separated by some annular region, where SCOs do not exist. B. Novosyadlyi, V. Pelykh, Yu. Shtanov, A. Zhuk. Dark Energy and Dark Matter of the Universe. Ed. by V. Shulga (Kiev, Akademperiodyka, 2013), Vol. 1 [ISBN: 978-966-360-240-0]. A. Linde. Inflationary Cosmology after Planck 2013. (2014) arXiv:1402.0526 [hep-th]. V. Sahni. Dark matter and dark energy. Lect. Notes Phys. 653, 141 (2004). O. Sergijenko, R. Durrer, B. Novosyadlyj. Observational constraints on scalar field models of dark energy with barotropic equation of state. JCAP 08, 004 (2011). I.Z. Fisher. Scalar mesostatic field with regard for gravitational effects. Zh. Exp. Theor. Phys. 18, 636 (1948) (in Russian). A.I. Janis, E.T. Newman, J. Winicour. Reality of the Schwarzschild singularity. Phys. Rev. Lett. 20, (1968). J.D. Bekenstein. Black holes: classical properties, thermodynamics and heuristic quantization. In: Cosmology and Gravitation, M. Novello, ed. (Atlantisciences, 2000). V.I. Zhdanov, O.S. Stashko. The body motion in gravitational field of a spherically symmetric configuration with scalar field in General relativity. 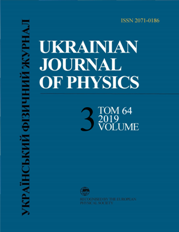 Bulletin of Taras Shevchenko National University of Kyiv, 56, 35 (2017). L.D. Landau, E.M. Lifshitz. The Classical Theory of Fields: Vol. 2 (Course of Theoretical Physics) (Elsevier, 1987) [ISBN: 978-0750627689].